Dudley Graham Johnson was born in the then Parish of Bourton-on-the-Water on the 13th February 1884 and lived in Rockcliffe House Nr Upper Slaughter. He started military service with the Wiltshire Regiment in 1901 and fought in the 2nd Boer War before transferring to the South Wales Borders in 1903 (the same regiment that fought at Rorke’s Drift some 20 years earlier). He mainly carried out regimental duties in his early career in the UK, Mauritius and Hong Kong and was promoted to Lieutenant in 1907 and Captain in 1912. He was present at one of the first battles of WWI in Tsingtao China and was awarded his first Distinguished Service Order (DSO) on 5th/6th November 1914. He was shot and wounded at Gallipoli on the 25th April 1915; he was awarded a MC on 1st January 1918 and was wounded again on 27th May 1918. While he served with the Royal Sussex he was awarded a second DSO on 18th September 1918. He was awarded the Victoria Cross, and was one of the last recipients to receive this award in WWI for action on 4th November 1918 at Sambre Canal Northern France. He held various roles post-war, and was promoted to Major General on the 25th December 1937; he was awarded a CB in 1939. He also fought at Dunkirk in 1940 and was an Aide-De-Camp (ADC) to King George VI, the Queen’s father, between 1942 and 1944. 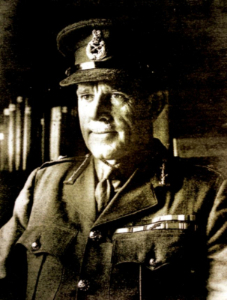 In 1944 he became Colonel in Chief of the South Wales Borders, which post he held from 1944 to 1949 and then retired after nearly 50 years’ of Army Service. He died on 21st December 1975 aged 91, and is buried in Church Crookham Hampshire. To commemorate the actual 100th anniversary of the awarding of the VC, family members, and representatives from various Parish Councils, CDC, and groups and associations he belonged to were present to mark the occasion; this included a party of Year 6 school children from Bourton Primary school who visited the area on a school trip. A talk with pictures about the life of Dudley Graham Johnson was given by his Grandson Andrew Larpent OBE. To commemorate the awarding of a VC to a local resident in WWI the Government supplied a plaque to every City, Town and Village to mark the occasion. Bourton hosted the plaque unveiling and dedication event on 10th November with many dignitaries attending, along with local Scouts, Guides, Cadets, Youth Groups, WI, serving military and ex-servicemen, who marched with the 7th Rifles Band from the Royal British Legion in Lansdowne and proceeded to the War Memorial. The Citation was read by the Head Boy and Girl from the Cotswold School followed by a dedication of the stone. The Band then marched back to the RBL where refreshments were provided by the WI to the family and various dignatories. The History Society kindly agreed to display photos themed to reflect the War-time commemoration and replica medals in the Victoria Hall throughout the weekend. The plaque and citation which pays tribute to this brave soldier is now on permanent display within the War Memorial enclosure on Bourton’s Village Green. The usual Remembrance Sunday service was held at the War Memorial in the morning. With kind permission of John & Ken Hackling, and in line with the national commemoration, a Beacon of Light was lit on the Industrial Estate in the evening and this was followed by the bells at St Lawrence’s Church ringing out to mark the ending of WWI. Photographs were taken throughout the weekend by local resident Sandra Thurgood and can be viewed by clicking on this link. On 4th November 1918 the last major offensive action on the Western Front in World War 1 took place in Northern France. The Germans had mounted a defensive line along the length of the Sambre Oise Canal. To provide crossing sites for armour and follow on formations it was essential to secure various locks on the canal. 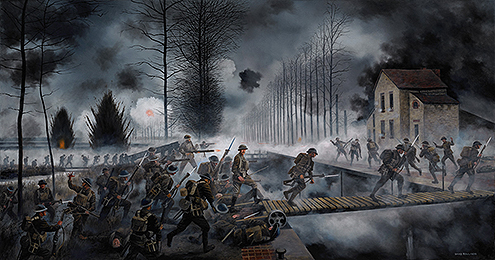 In the battle to seize the lock site near the small village of Rejet de Beaulieu, 2nd Battalion The Royal Sussex Regiment, supported by 409th (Lowland) Field Company, Royal Engineers, led the assault across the lock. For his courageous and exemplary leadership under intense artillery and machine gun fire, the Commanding Officer of 2nd Royal Sussex, Lt Col Dudley Graham Johnson DSO MC, was awarded the Victoria Cross. On 4th November 2018 the descendants of Dudley Johnson attended a ceremony in France at which a copy of the painting was presented to the community of Rejet de Beaulieu for display in the village hall/mairie. An additional copy of the painting was purchased using donations from Bourton’s Parish Council, Royal British Legion and Local Businesses which is on display in The George Moore Community Centre.